Please join us for a Prosecco & Macarons reception at Dunnington Bartholow & Miller LLP to discuss all things fashion law on the topic of trademarks! RSVP to CVidulich@dunnington.com. What makes this case interesting is its focus on trademark claims. Typically, ITC petitions have centered around patent infringement claims, with trademark disputes limited to approximately one petition every two years. While BIC also filed a trademark infringement lawsuit in the U.S. District Court for the Eastern District of New York, civil judgments are often difficult to enforce against small overseas companies, who may cease their operations only to reemerge under new names, or in new locations. BIC hopes that a general exclusion order from the ITC, which allows brand owners and intellectual property owners to stop all counterfeit products from being imported into the United States, not just those of identified defendants, will protect its rights in the trade dress of its disposable cigarette lighters. (1) the Vans Side Stripe Trademark, in contrasting color to the shoe upper; (2) a white rubberized midsole; (3) a contrast line around the top edge of the midsole; (4) a texturized toe box outer around the front of the midsole; (5) padded corrugated ankle collars; and (6) visible stitching, in contrasting color, including where the lace bracing meets the vamp, separating the individual padded ankle collar corrugations, and bisecting the Vans Side Stripe Trademark. The lawsuit alleges that Primark “is engaged in designing, manufacturing, advertising, promoting, selling, and/or offering for sale apparel, footwear, and accessory products . . . bearing logos and source-identifying indicia that are studied imitations of Vans’ trademarks.” Vans also pointed out that Primark’s allegedly infringing shoes brazenly bear names similar to its Sk8-Hi model, including “Skater” low tops and “Skate high tops,” “in a blatant attempt to suggest a connection with Vans’ products that bear the Vans’ Trademarks and Trade Dress.” In addition to seeking a preliminary injunction against Primark’s sale of any goods bearing confusingly similar imitations of Vans’ trademarks and/or trade dress (as well as the impoundment or destruction of such goods), Vans seeks monetary damages, including Primark’s profits from the infringement, and requests that any damage award be tripled based on Primark’s willful infringement. The case is captioned Vans, Inc. and VF Outdoor, LLC v. Primark Stores Ltd., 1:18-cv-07214 (E.D.N.Y. 2018). A copy of Vans’ complaint can be found here. United Parcel Services (“UPS”) filed a complaint on February 13, 2019 in the District Court for the Central District of California against a group of California-based marijuana delivery businesses for federal trademark infringement, trademark dilution, false designation of origin, false advertising, unfair business practice and injunctive relief. The delivery giant is seeking a permanent injunction against the defendants to prevent them from using its marks and logos and an unspecified amount of monetary damages. UPS accuses United Pot Smokers, UPS420 and THCPlant (the “Defendants”) of using names and logos that are confusingly similar to its mark and well-known shield logo to sell cannabis-related products through the websites www.ups420.com and www.UPS.green. UPS also alleges that in addition to the inclusion of its trademarks in the above-mentioned URLs, the websites describe themselves as ”nationwide logistic expeditor” that “securely packs & ships to ALL 50 states of domestic USA” which is likely to mislead or deceive the consumers by making them believe that the Defendants are affiliated to UPS. On February 15, 2019, the District Court judge recognized the “obvious similarities” between the signs used by the Defendants and UPS’ mark and logo. However, he denied UPS’ request for temporary restraining order considering that the “Defendants should […] have the chance to be heard” before such preliminary injunction could be granted. The Judiciary Committee of the Senate created a subcommittee that will have jurisdiction over the USPTO and the US Copyright Office, and will serve other IP related functions. The Senate subcommittee adds to the already existing IP House Judiciary Committee known as the Subcommittee on Courts, Intellectual Property and the Internet. Thom Tillis, who was appointed as chairman, referred to China’s IP theft and to the confusion over patent eligibility. "In recent years our country has been faced with a number of challenges in our intellectual property system, from rampant theft from state actors like China to confusion among innovators and inventors about what is even patentable," Tillis explained. "These issues are causing our nation's economy to lose billions of dollars annually and threaten our country's long-term technological dominance." Subcommittee members showed interest in passing legislation that provides guidance, and clarifies which inventions are eligible for patenting, and which are not. Campbell Soup Company registered the trademark of the word ‘Chunky’ with the U.S. Patent and Trademark Office. In its application, Campbell referenced the “massive unsolicited media coverage of Chunky” in shows like The Simpsons, Saturday Night Live, Family Guy, and in songs of artists such as Lloyd Banks, Rakim, and rapper Ghostface Killah. Even Pulitzer Prize-winning author Colson Whitehead wrote about Campbell’s Chunky soup in his novel named Sag Harbor. The registration certificate noted that the word was first used by Campbell Soup Company in 1969. Campbell claims that they spent $1 billion in advertising since 1988 including NFL sponsorships, and that they sold more than $13 billion worth of Chunky soup. On February 6, the Pittsburgh-based Eat’n Park restaurant chain brought an action against New York cookie-maker Eleni’s for trademark infringement, trademark dilution, and unfair competition claiming that the popular bakery used its registered trademarks for smiling cookies in breach of the parties’ license agreement. According to the complaint, Eat’n Park has been selling its signature smiling face cookies since 1987, and it has registrations for the smiling face design and the words SMILEY for “pancakes and cookies.” In 2009, after Eat’n Park learned that Eleni’s had been selling a cookie bearing a confusingly similar smiling face, the parties entered into a license agreement in which Eleni’s was granted the right to continue to sell the smiling cookies. Eat’n Park commenced the lawsuit after Eleni’s stopped paying it royalties but continued to sell the cookies. The case is pending in the U.S. District Court for the Western District of Pennsylvania. Marc Jacobs, Saks Fifth Avenue, and Neiman Marcus were not smiling when rock band Nirvana sued them for copyright infringement and trademark infringement for Marc Jacobs’ “Bootleg Redux Grunge” collection of clothing released in November 2018 which prominently features Nirvana’s “Smiley Face” logo. Nirvana claims that it first used and licensed the logo in 1992 for a wide variety of goods including clothing. The complaint alleges that Marc Jacobs copied Nirvana’s copyrighted image on clothing in the collection and used it as the signature image in its advertisements for the collection as an attempt to intentionally mislead the public into falsely believing that Nirvana endorses the collection. Nirvana claims that Marc Jacobs even incorporates various Nirvana references in its marketing campaign including song lyrics and clips of Nirvana music videos on its social media to further confuse the public into believing that the parties are associated. The defendants must respond to the complaint by March 8. The case is pending in the U.S. District Court for the Central District of California. On February 14, 2019, State Street Global Advisors Trust Company (“SSGA”) filed a complaint against the artist of New York City’s iconic “Fearless Girl” statue, claiming that the artist, Kristen Visbal, infringed on SSGA’s trademark rights and materially breached its contractual obligations to SSGA by delivering a replica statue to customers in Norway and Australia without authorization from SSGA. According to the Complaint, Visbal was hired by SSGA to sculpt the statue based on the designs that SSGA had developed with their consultants and agents. The Fearless Girl statue, which can be found in Bowling Green NYC, was introduced during the 2017 International Woman’s Day as a symbol of SSGA’s commitment to fighting gender biases. SSGA is asking that the court compel Visbal to mediate the dispute and is seeking injunctive relief and exemplary damages. The case is filed in the Supreme Court of the State of New York and is captioned State Street Global Advisors Trust Company v. Kristen Visbal, case number 650981/2019. A copy of the complaint can be found here. Click here to be redirected to the related Law360 article. FBA Fashion Law Conference earlier this month was simply fabulous. Thank you to the FBA staff for pulling it off, and special thanks to FBA President Maria Vathis (Bryan Cave) and keynote speaker Gary Sheinbaum (CEO, Tommy Hilfiger Americas), as well as our in house speakers Rita Odin (Estee Lauder), Marilee Holmes (Wilhelmina), Lena Saltos (Urban Outfitters), Michael Khorsandi (Ross Stores), Bert Kaminski (Servicemax), and Stacy Yeung (Bayer). Last but not least, a huge thank you for our panels of attorneys (and one judge) who have contributed their knowledge and expertise in the field of fashion law: Frances Hadfield (Crowell & Moring), Nicola Tegoni (Dunnington Bartholow & Miller LLP), Hon. Mimi Tsankov (Immigration - in her personally capacity), Dyan Finguerra-duCharme (Pryor Cashman), Deanna Clark-Esposito (Clark-Esposito Law Firm), Laurine Janin-Reynaud (Duclos Thorne), David Stepp (Crowell & Moring), Jeanne Curtis, April Capati (Lerner David), Maria Vathis (Bryan Cave) and… ME! Super huge thank you to Fili Bajovic of CACOTEC, who provided an insider’s perspective on fashion tech. I spoke on my favorite topics: trademarks (of course, what else?) as well as wearable tech - and moderated four of the six panels. We covered international trade, fashion tech, design patents, trademarks, immigration and retailer issues. Hope to see you in Paris in September! On January 4, the U.S. Supreme Court granted certiorari to the USPTO to decide whether the Lanham Act’s prohibition on the federal registration of “immoral” or “scandalous” marks violates the First Amendment. The Supreme Court’s decision to hear the case comes less than two years after it unanimously ruled in Matal v. Tam that a similar part of the trademark law that banned the registration of “disparaging” trademarks violated the First Amendment. In Matal, an Asian-American rock band called The Slants attempted to register its name for trademark protection, but was denied because the USPTO decided that the mark would be likely to offend Asian-Americans. The case involves the USPTO’s denial of registration to a clothing line called FUCT because the mark was “scandalous.” In December 2017, the U.S. Court of Appeals for the Federal Circuit ruled that the government’s ban on registering profane, sexual and otherwise objectionable language violates the First Amendment. In the opinion, U.S. Circuit Judge Kimberly A. Moore wrote, "The First Amendment…protects private expression, even private expression which is offensive to a substantial composite of the general public.” The Court found, as it did in Tam, that the ban regulates the expressive component of trademarks and so cannot be treated as commercial speech, and that the clause could not satisfy strict scrutiny. Thus, the Court ruled that the ban on scandalous and immoral trademarks was unconstitutional. In a consolidated opinion dated January 17, 2019, the TTAB decided successive appeals filed by Starbucks Corporation (“Starbucks”) from the USPTO’s final refusal to register two proposed marks consisting of “a green circle placed centrally on the front exterior side of white cup,” reversing the PTO’s final refusal in one case, and affirming the refusal in another. The ‘872 Application similarly featured a drawing of the proposed mark depicting a green circle placed centrally on the front exterior of a white cup; however, unlike the ‘423 Application,Starbucks disclaimed that portion of the drawing representing the cup. The Examining Attorney refused the ‘872 Application on a number of grounds, including that Starbucks had not established that the mark had acquired distinctiveness. In affirming the PTO’s final refusal, the TTAB concluded that the mark depicted in the ‘872 Application had not acquired distinctiveness. In particular, the TTAB questioned the probative value of a consumer marketing survey offered by Starbucks as evidence of acquired distinctiveness, noting several problems with the survey’s design. A link to the TTAB’s 52-page decision can be found here. The Cancellation Division of the European Union Intellectual Property Office revoked McDonald’s trademark on the Big Mac burger after a dispute with Supermac, an Irish fast-food chain. In its decision, the EUIPO found that McDonald’s failed to provide sufficient evidence to prove genuine use of the name “Big Mac” in the EU. In the case, Supermac argued that the trademark should be revoked because it “was not put to genuine use” in relation to the registered goods and services. The Cancellation Division agreed and found that the evidence submitted by McDonald’s was “insufficient to establish genuine use of the trade mark.” McDonald’s had submitted affidavits of company representatives from Germany, France, and the UK. It also submitted website printouts where the term “Big Mac” was referenced. The EUIPO, however, said about the websites that “it could not be concluded whether, or how, a purchase could be made or an order could be placed.” The EUIPO further found that although McDonald’s had been able to demonstrate some evidence of use, it could not show the extent of such use. The ordered revocation is retroactive and takes effect as of the date in which the application for revocation was filed, which is April 11, 2017; McDonald’s still has the right to appeal the decision. On January 11th, a jury in the U.S. District Court in Santa Ana, stripped the Mongols Motorcycle group of its trademarked logo after previously finding the entity, Mongol Nation, guilty of racketeering and conspiracy in December of 2018. This means that the Mongols will have to forfeit their legal interest in the word "Mongols," along with some of their patches, which prosecutors said were used to distinguish members who have committed murder or engaged in acts of violence on behalf of the gang. The decision to seize the logo follows a decade long pursuit by prosecutors to dismantle the Mongols after 77 members were infiltrated by the U.S. Bureau of Alcohol, Tobacco, Firearms, and Explosives in 2008 and convicted of racketeering. A hearing was scheduled for January 8th, 2019 to argue the terms of the forfeiture; a judge could also impose fines at a later sentencing hearing. The case is filed in the Central District Court of California and is captioned USA V. Mongol Nation, an Unincorporated Association No. 15-50442 (9th Cir. 2017). A docket for the case can be found here. Click here to be redirected to the related NYTimes article. On January 11th, the Vermont-based publisher of the Choose Your Own Adventure book series filed a complaint against Netflix for infringing on the “Choose Your Own Adventure” trademark. Chooseco LLC claims that the interactive episode, ‘Bandersnatch,’ from the Netfllix show Black Mirror is so dark that it will disparage the books’ reputation. In their complaint, Chooseco states that “the use of Choose Your Own Adventure in association with such graphic content is likely to cause significant damage, impacting our book sales and affecting our ability to work with licensing partners in the future.” The episode, which was released on December 28th, 2018, is centered around a video game designer who asserts that his video games are based on “Bandersnatch…a Choose Your Own Adventure book.” Chooseco claims that Netflix had pursued a license to use “Choose Your Own Adventure”’ in connection with films and interactive cartoons, but failed to secure the license after actively negotiating with Chooseco. Chooseco claims that they subsequently sent a cease and desist letter to Netflix prior to the release of the Bandersnatch episode. Chooseco is seeking injunctive relief and damages of at least $25 million for the alleged infringement. The case is filed in the United States District Court in Vermont and is captioned Chooseco LLC v. Netflix, Inc., 2:19-cv-00008. A copy of the complaint can be found here. Click here to be redirected to the related article on The Verge. Red Bull accused Milton Lukoil gas station of selling Red Bull drinks that are not authorized for sale in the U.S. These drinks are “materially different” from those sold in the U.S., and do not fulfill all the U.S. regulatory requirements. The complaint asserts that the drinks were intended for sale in South Africa and other countries and thus are not appropriately labelled, travel through unauthorized supply chains, and lack a toll-free U.S. number for consumers to call with questions or concerns, among other deficiencies. Red Bull alleges counts for trademark infringement, and unfair competition in violation of the Lanham Act and New Jersey law. The complaint alleges that Milton Lukoil’s acts “have injured Red Bull’s business reputation and relations with retail accounts in the United States by causing customer dissatisfaction, a diminution in value of the goodwill associated with the RED BULL Marks, and a loss of Red Bull’s sales and market share to its competition.” Red bull intends to enjoin Milton Lukoil from selling the drinks and seeks attorney’s fees. Please join me January 10th for a Fashion Law CLE covering non-traditional trademakrs in the fashion industry. To register online or live, please go to bit.ly/250Park and RSVP to tcarter@dunnington.com. Looking forward to seeing you there! In late November, Jay-Z and his legal team sought a temporary restraining order before Judge Saliann Scarpulla of the New York Supreme Court to stay arbitration of an ongoing trademark dispute because of an alleged lack of diversity in the American Arbitration Association (AAA). The issue arose after Iconix Brand Group, the owner of several clothing brands, claimed in a 2017 lawsuit that a deal to license the “Roc Nation” logo to Major League Baseball Properties in connection with a line of special edition baseball caps infringed its rights in the ROC NATION mark, which lconix argued it had acquired as part of its 2007 purchase of Jay-Z’s Rocawear clothing brand. Iconix filed an arbitration proceeding against Jay-Z’s team on October 1; however, Jay-Z’s legal team opposed the arbitration on equal protection grounds, arguing that the list of 200 prospective arbitrators authorized to hear the matter included only three individuals identified as African-American, one of whom was conflicted out of the matter. While Judge Scarpulla granted Jay-Z’s motion for a temporary restraining order, his attorneys subsequently withdrew the motion after the AAA acknowledged the dearth of minority arbitrators and indicated a willingness to undertake remedial measures intended to improve the diversity of arbitrators in both Jay-Z’s case and in future arbitrations. A status conference in the case is set for March 2019. The case is Shawn C. Carter et al. v. Iconix Brand Group, Inc. et al. found here. Gucci and “fast fashion” retailer Forever 21 have settled their legal dispute over whether Forever 21’s use of blue-red-blue and green-red-green stripes on clothing and accessories infringes Gucci’s trademarks. Forever 21 originally filed a declaratory action against Gucci in the U.S. District Court for the Central District of California, seeking both a declaration that its use of colored stripes did not infringe Gucci’s trademark rights and cancellation of a dozen of Gucci's trademark registrations. In its Complaint, Forever 21 argued that stripe designs are much too common to serve as trademarks, do not serve as source-identifiers, and are widely used by brands such as Louis Vuitton, Balenciaga, Tory Burch, J. Crew and Urban Outfitters. Thereafter, Gucci moved to dismiss the case, arguing that Forever 21 had not provided any evidence that other parties are, in fact, using Gucci’s blue-red-blue and green-red-green striped trademarks. The parties’ reported settlement comes after Judge Fernando M. Olguin rejected Gucci’s request to dismiss Forever 21’s trademark cancellation claims, finding that the claims are “viable” and should be decided at trial. The California district court has filed an order to show cause regarding the settlement and dismissal, ahead of the still-scheduled pre-trial conference scheduled for Monday, February 4, 2019. The case is Forever 21, Inc. v. Gucci America, Inc., et al., 2:17-cv-04706 (C.D.Cal), found here. Click here for the related article on The Fashion Law. On December 7, 2018, ‘Ebony’ magazine sued online competitor ‘The Root’ asserting, among other things, claims of trademark infringement, trademark dilution and unfair competition. The suit arises out of an article published by The Root on November 28, 2018, which calls out Ebony for failing to pay its writers. The offending article is entitled “Dear Ebony Magazine: FU, Pay Your Writers!” and includes a mock Ebony magazine cover attributed to the article’s author, Lawrence Ross, featuring the well-known red and white Ebony logo. Ebony’s lawsuit claims that defendants have “engaged in a systematic campaign of misinformation regarding Plaintiff and its agents since at least April 19, 2017,” and that allegations that Ebony and its owners have not paid their writers while “spending the thousands owed to black writers” on an expensive gala are “misrepresentations” that resulted in damage to Ebony’s reputation and business relationships (the lawsuit also seeks damages for The Root’s alleged tortious interference with Ebony’s prospective economic advantage). The complaint similarly criticizes the article’s accompanying artwork, which, in plaintiff’s words, contains “1) the identifiable likeness of Plaintiff’s co-founders . . . , 2) false and misleading ‘headlines,’ 3) the famous EBONY Word Mark, and 4) the famous EBONY Logo Mark,” all used without Ebony’s consent. The lawsuit seeks, inter alia, injunctive relief, exemplary/punitive damages for defendants’ alleged willful willfulness, and a disgorgement of defendants’ profits. The Root article, found here, attempts to co-opt the #EbonyChallenge, a social media campaign in which consumers were asked to upload the Ebony magazine cover corresponding with their birth month and year. In protest of Ebony’s alleged failures to compensate its writers, Ross asks readers to upload the mock Ebony cover with the hashtags #EbonyChallenge and #EbonyStillOwes. Ebony’s lawsuit, filed in the Southern District of New York, is captioned Ebony Media Operations, LLC v. Univision Communications, Inc., 1:18-cv-11434. The Complaint can be found here. Zippo announced earlier this month the sound trademark of their famous lighter. The mark was registered for international class number 34, as a mark drawing type number 6, used for sensory marks, and was described as “the sounds of a windproof lighter opening, igniting, and closing”. Zippo had already filed an application in the past, which was abandoned after more than two years of legal gridlock. With this new registration, Zippo’s lighter being flicked open and sparked joins MGM’s lion roar, and The Hunger Games’ Mockingjay Whistle, as some of the few sound marks to be registered with the USPTO. In 2015, retailer Vineyard Vines LLC and “The Real Housewives of New Jersey” star Margaret Josephs and her company (collectively, “Josephs”) entered into a confidential settlement agreement after Vineyard Vines accused Josephs of creating and distributing products that infringed on its intellectual property rights, including its iconic whale logo. As part of the settlement, U.S. District Judge Sarah A.L. Merriam for the District of Connecticut entered a permanent injunction barring further infringement and a final judgment requiring Josephs to pay Vineyard Vines $300,000 in installments as damages stemming from the infringement. The order also stated that if Josephs violated the injunction, Vineyard Vines could be entitled to $500,000 in liquidated damages and additional relief. On December 5, Judge Merriam found that Josephs violated the injunction by authorizing a third-party company to “sell off” the remaining infringing merchandise after the injunction was issued. The court ordered Josephs to pay Vineyard Vines $110,000 as an unpaid judgment award and $500,000 in liquidated damages plus a provisional grant of attorneys’ fees. On November 27, hip hop recording artist James Smith (aka “LL Cool J”) sued concert promoter Guerilla Union Inc. claiming that the company used the title of Smith’s 1985 song “Rock the Bells” without authorization. According to the complaint, the company that organized a series of hip hop music festivals called “Rock the Bells” used the phrase in its web domain “rockthebells.net”, Twitter account “@rockthebells”, and “Rock the Bells” Facebook and Myspace accounts even after Smith successfully cancelled Guerilla Union’s registration for the mark in five classes before the Trademark Trial and Appeal board in October 2017. Smith is asking the court to require Guerilla Union to give him control of the websites and to surrender any merchandise branded with “Rock the Bells.” The case is pending in the U.S. District Court for the Central District of California. On November 14, 2018, Eymun Talasazan filed a lawsuit against Musician Abel Tesfaye AKA The Weeknd for federal trademark infringement, accusing the singer of stealing Talasazan’s “Starboy” comic book character. The Weekend, who has been known to use the “Starboy” moniker as an alterego, had released a studio album and song in 2016 baring the same name. In his complaint, Talasazan alleges that Talasazan had created a comic book universe (“Comic Book Universe”) in 2014 and that in 2016 he began collaborating with Stan Lee, the creator of Marvel, on developing the story arc and characters in that Comic Book Universe. Prior to that, however, Talasazan had allegedly contacted The Weeknd to create a collaboration using the singer’s stage name, but according to the complaint, The Weeknd never responded. The complaint alleges that The Weeknd began separately collaborating with Marvel on the release of a comic bearing his stage name, without including Talasazan, and that collaboration launched in June of 2018. Talasazan filed a trademark application on October 18, 2017 for “Starboy” in connection with “Comic books.” Then on March 23, 2017, he filed another application for “Starboy” in connection with “Entertainment services, namely, production and distribution of ongoing television programs in the field of drama.” The Weeknd and his legal team have filed an opposition to Talasazan’s trademarks, claiming that Talasazan only included comics in his Trademark application after the announcement that the Weeknd and Marvel would be releasing the Starboy Comic. Talasazan’s legal team tells TMZ that this case will determine whether a songwriter automatically gains trademark protection for all later uses of a word, without formally filing a trademark application. He is not only suing The Weeknd for Trademark infringement, but wants all copies of the Starboy Comic recalled, impounded and destroyed. The case filed in Central District of California is Eymun Talasazan vs. XO Trademarks, LLC, et al. (Case No: 2:18-cv-09611). The complaint can be found here. On December 7, 2018, fashion brand Alice + Olivia (“A + O”) filed a lawsuit against Betsey Johnson and its parent company, Steve Madden, for using an image depicting Stacey Bendet, A + O’s founder and creative director (known as the “StaceFace” design), to sell a line of Betsey Johnson handbags. According to A+O’s complaint filed in Southern District of New York, A+O sent a cease and desist letter earlier in the year, which resulted in the parties coming to a resolution in March where Betsy Johnson and Steve Madden agreed to stop manufacturing and selling the handbags in question. Then in September, A+O claims that they “identified new goods from the defendants that mimicked the StaceFace design,” noting that the only difference in the new products were the shape of the glasses on the StaceFace design, which were now hearts instead of circles. The lawsuit claims that Bendet’s name and likeness are “well known” and “inexorably associated with the A + O brand” and includes causes of action for copyright, trademark and trade dress infringement, trademark dilution and unfair competition. The case is Alice + Olivia, LLC v. BJ Acquisition, LLC and Steven Madden, LLC, 1:18-cv-11482 (SDNY). Click here to be redirected to the related article on The Fashion Law Blog. Click here for the complaint. Join us for the Federal Bar Association's Fashion Law Conference on February 8th, 2018 held at the historical and stunning The National Arts Club. An all-day intensive CLE conference featuring the hottest topics in #fashionlaw covered by expert speakers. Topics covered include #intellectualproperty #trademarks #copyrights #designpatents #tariffs #china #imports #exports #immigration #trumpadministration #wearabletech #fashiontech #retail #licensing #realestate and #classactions. Our keynote speaker is Gary Sheinbaum, CEO, Tommy Hilfiger. Panelists include Filip Bajovic, CEO, Cacotec; Prof. Christopher J. Buccafusco, Cardozo Law School; Zhiwei Chen, Bryan Cave, PRC Consultant; Deanna Clark Esposito, Clark-Esposito Law Firm PC; Prof. Jeanne Curtis, Cardozo School of Law; Dyan Finguerra duCharme, Partner, Pryor Cashman; Frances Hadfield, Counsel, Crowell & Moring; Marilee Holmes, Vice President of Operations and General Counsel, Wilhelmina Models; Laurine Janin-Reynaud, SCP Duclos, Thorne, Mollet-Viéville & Associés; Bert Kaminski, Chief Commercial Counsel, GE Digital; Lorenzo Marcelli-Flori, Assistant General Counsel North America Real Estate and Business Services, Luxottica; Olivera Medenica, Partner, Dunnington Bartholow & Miller LLP; Rita Odin, Vice President and Senior Trademark Counsel, The Estee Lauder Companies, Inc.; Lèna Saltos, Associate General Counsel, Global Director of IP, URBN Urban Outfitters, Inc.; David Stepp, Partner, Crowell & Moring; Nicola Tegoni, Partner, Dunnington Bartholow & Miller LLP; Hon. Mimi Tsankov; Maria Vathis, Counsel, Bryan Cave, and FBA President; Stacy Yeung, Senior Counsel, Consumer Health Division, Bayer. Registered attendees will receive an invitation to a private cocktail reception to be held at Kate Spade New York's flagship townhouse on Madison avenue. To register, click here. Great panel yesterday at NYCLA Continuing Legal Education Institute on Ethics and Social Responsibility in the Fashion Industry. If you missed it, it will be available on demand at NYCLA. Great discussion about #FashionLaw, #sustainability, #socialresponsibility, #socialaccountability, #ethics, #ethicalsourcing. Huge thank you to the speakers Vanessa Barboni, Alice Tepper Marlin, Lewis Tesser, Deanna Clark-Esposito, Esq. and Bari Chase, along with her staff. It was a much needed discussion on an important topic. “Happy Thanksgiving” by Deb Hystrom licensed under CC by 2.0 - no changes made. On October 26, 2018, the U.S. Supreme Court granted a petition for certiorari in the case Mission Product Holdings Inc. v. Tempnology, LLC to decide whether a licensee may retain licensed trademark rights even after its license agreement has been rejected by the licensor pursuant to section 365 of the Bankruptcy Code, 35 U.S.C. 365(a). The Court’s decision will resolve a split among the circuit courts as to whether rejection of a trademark license under section 365 of the Bankruptcy Code terminates the licensee’s rights in the subject trademark, or should merely be viewed as a breach by the debtor-licensor, entitling the licensee to continued trademark rights. The Petitioner, Mission Product Holdings, Inc., argued to the First Circuit Court of Appeals below that section 365(n) provides an exception to section 365(a)’s broad rejection authority by limiting the debtor’s ability to terminate intellectual property licenses it has granted to other parties; however, the appellate court rejected that argument, holding that Section 365(n) applies only to specifically enumerated intellectual property rights and excludes trademarks, which are not included within the definition of intellectual property rights in the bankruptcy code. The case is Mission Product Holdings Inc. v. Tempnology, LLC, No. 17-1657, 2018 WL 2939184 (U.S. Oct. 26, 2018). Click here for a copy of the petition and here for a copy of the case docket. On October 30, 2018, the Federal Circuit overturned a 2016 decision by the International Trade Commission (“ITC”) that invalidated Converse, Inc.’s 2013 registration covering the design of its Chuck Taylor sneaker and declared that Converse lacked common law rights to the design for the period before the registration was issued. The decision, which revives Converse’s longstanding trademark suit accusing Sketchers USA Inc., New Balance Athletics, Inc. and others of knocking off the sneaker design, holds that the ITC “applied the wrong legal standard” and improperly analyzed whether aspects of the shoe’s design, known as its trade dress, had acquired secondary meaning for consumers. However, the appeals court also determined that Converse’s registration, even if valid, would not entitle Converse to a presumption of secondary meaning. As a result, the lawsuit will be heading back to the ITC for a ruling, and Converse will have another shot at proving that the Chuck Taylor’s design acquired secondary meaning before Sketchers and New Balance began selling similar shoes. Click here to be redirected to the related article on Law360. On November 6, 2018, the Girl Scouts of the United States of America filed a trademark infringement lawsuit against the Boy Scouts of America in the Southern District of New York. This suit was prompted by the Boys Scouts’ announcement on October 11, 2017 that they will drop the word “boy” from “boy scouts” and start admitting girls into their program. In their complaint, the Girl Scouts allege that “only GSUSA has the right to use the Girl Scouts and Scouts trademarks with leadership development services for girls,” and that the move by the Boy Scouts will “erode its core brand identity.” The Girl Scouts seek monetary damages and a permanent injunction against the Boy Scouts for the alleged infringement and also seek a court order to block the Boys Scouts from using the words “Scout,” “Scouts,” “Scouting,” or “Scouts BSA” without having a distinguishing word appear immediately before it. While the Boy Scout’s decision to include girls in their program may come as surprise, the organization points out that it has had co-ed participation since 1971 through their Exploring and Venturing programs. Click here to be redirected to the related article on the ABA Journal. Click here to be redirected to the Complaint. Nintendo recently settled its trademark and copyright infringement lawsuit against the operators of two websites offering pirated copies of read-only memory (ROM) files collected from Nintendo cartridges without authorization in exchange for a permanent injunction and consent judgment in excess of $12 million. In the lawsuit, which was filed in an Arizona district court, Nintendo alleged that defendants regularly reproduced, distributed, publicly performed and displayed unauthorized copies of Nintendo’s video games (including its proprietary software, registered trademarks and logos, copyrighted music works and audio recordings) in violation of federal trademark and copyright laws, and sought injunctive relief, as well as an accounting of defendants’ profits and damages. According to torrentfreak.com, the settlement was reached after defendants voluntarily shut both websites down in July 2018 and admitted to direct and indirect copyright and trademark infringement. An article discussing the settlement is also available on Nintendo’s website here. The Recording Industry Association of America requested that the Ninth Circuit undo its ruling on the “Stairway to Heaven” holding. This past September, the Ninth Circuit vacated a lower court’s copyright holding that Led Zeppelin’s “Stairway to Heaven” did not infringe a 1967 instrumental ballad called "Taurus" by the band Spirit. The RIAA argues that the ruling threatens to “badly overprotect” copyrights. Plaintiff Michael Skidmore, as trustee of the Randy Craig Wolfe Trust (Wolfe was a member of the band Spirit), initially filed a complaint in the District Court for the Central District of California against Led Zeppelin alleging that the iconic song “Stairway to Heaven” infringed Plaintiff’s copyright in “Taurus,” a song written by Wolfe. After trial, the jury returned a verdict in favor of Led Zeppelin, finding no infringement. On appeal, Skidmore argued that the district court committed reversible error by, among other things, not instructing the jury that the selection and arrangement of unprotectable musical elements may be protectable when arranged in a creative way, and by precluding the jury from hearing sound recordings of “Taurus” as played by Spirit. The Ninth Circuit agreed with appellant, vacated the lower court’s decision and ordered a new trial. The Ninth Circuit ruling can be found here. The U.S. Patent and Trademark Office is working on a rule that will require foreign trademark applicants to engage a U.S. attorney to file trademark documents with their office. According to the USPTO, this new requirement will ensure foreign applicants’ compliance with trademark regulatory requirements, will increase confidence that their registrations are not invalidated for improper signatures and use claims reasons, and will help the USPTO improve accuracy of the U.S. Trademark Register. A public comment period of proposed rulemaking will start in November and end in February 2019, and the rule will become effective in July 2019. Thank you to the Lawline team for making me feel welcome while shooting the #wearabletech presentation. Check it out at lawline.com and get your CLEs on a fun topic. Thank you to the incredible Valerie Oyakhilome for helping me prepare. Turner Entertainment Co. (subsidiary of Warner Bros.) filed a petition against Wicked Witch Studios’, application for WICKED WITCH MOJO used in connection with its magical line of “candles, aromatic essential oils, incense, and scented room sprays” which are available in in metaphysical shops nationwide. In its opposition, Turner claims that it owns a family of famous marks containing the words “Wicked Witch,” which are registered for a variety of goods. It claims that Wicked Witch Studios is attempting to mislead customers into believing that the mark is licensed and to dilute its famous marks. On September 24, Paris-based luxury fashion house Balenciaga opposed a trademark application filed for PAWLENCIAGA used in connection with “clothing for pets, namely, hoodies, tee shirts, polo style shirts, button down shirts, jackets, vests, and scarves.” Balenciaga states in its opposition that, if registered, the mark will confuse customers into associating the “parody streetwear” for pets with its famous marks for high-end apparel. Considering the fact the TTAB has said that it will not follow the precedent of the Fourth Circuit’s Louis Vuitton v. Haute Diggity Dog case which allows for statutory fair use, the parody defense before the Board may be a bit far-fetched. On October 19, owners of the 66-year-old LITTLE TREES Air Fresheners, filed a complaint in New York federal court against Balenciaga alleging that the company is manufacturing and selling $275 leather key chains that are deliberately designed to replicate their classic tree design. According to the complaint, Balenciaga’s website states that its luxury key chains are “inspired by the tree air fresheners for cars.” The owners say that not only are the key chains the same dimensions as their five registered designs, but they are even offered in the four colors associated with the most popular scents of LITTLE TREES Air Fresheners. This case is pending in the U.S. District Court for the Southern District of New York. A Florida law firm that uses the slogan “Ever Argued With a Woman?” sued a Texas law firm on October 9 in Texas federal court, for trademark infringement for using the slightly different slogan “Ever Argue With A Woman?” in connection with legal services. The Plaintiff first discovered the alleged infringement after the Defendant began using the slogan on billboards and Plaintiff began to receive inquiries from “confused members of the public” asking if her firm was related to Defendant’s. This case is pending in the U.S. District Court for the Western District of Texas. On September 28, Advance Publications, the parent company of Vogue and Condé Nast, filed a complaint in the U.S. District Court for the Southern District of New York against a 26-year old designer and activist Nareasha Willis for infringing on its famous 125-year-old trademark. It claims that Willis’ use of the mark BLACK VOGUE on apparel “mirrors the well-known font and stylization of (its) long registered Vogue trademark,” and is likely to cause confusion and dilution of its mark. Although the USPTO issued Willis an Office action on May 23 refusing to register the mark because of a likelihood of confusion with Vogue’s registered trademarks, Willis continued to use the mark. Willis must answer the complaint by October 25. On September 28, Judge Louis L. Stanton of the U.S. District Court for the Southern District of New York granted The Museum of Modern Art’s motion for a preliminary injunction and ordered café and art gallery MoMaCha to stop “using, displaying or promoting the MOMA or MOMACHA marks, and the https://momacha.com/ domain name.” In April, MoMA sued the café claiming that it willfully infringed on the museum’s registered trademark MOMA. MoMaCha claimed that it created its name by combining “more” and “matcha.” For now, the café has changed its name to MAMACHA. Click here to be redirected to the related article on The New York Times website. Click here to be redirected to the related article on the Reuters website. So honored to have participated as a panelist at University of Paris I: Panthéon-Sorbonne discussing legal issues on #wearables and #trademarks at the Federal Bar Association and French American Bar Association Fashion Law and Innovation Conference, along with Céline Bondard, Maria Vathis, Regina Polanco PYRATES smart fabrics, Zeeger Vink, Michael Schu, Benedicte Roumy-Bullier, Frédéric GALINIER and last but not least Joan Anfossi - Divol. What a wonderful time to be in Paris discussing all things #fashionlaw. See you next year! “Good Hair Day!” by Enokson is licensed under CC by 2.0 - no changes made. On September 10, Judge Laura Taylor Swain dismissed trademark infringement claims brought by Michael Gleissner, one of the world’s most infamous trademark trolls, against a Hong Kong-based satellite operator in the U.S. District Court for the Southern District of New York. Gleissner alleged that the satellite company engaged in contributory and vicarious trademark infringement for the marks FASHIONTV and FASHION TELEVISION by disseminating an allegedly infringing television channel, “Fashion TV,” through its satellite. Dunnington’s motion to dismiss filed by Raymond J. Dowd, Samuel A. Blaustein, and Hardin P. Rowley on behalf of the satellite operator, was granted for lack of personal jurisdiction. Multi-national consumer goods corporation, The Procter & Gamble Company, has filed intent to use trademark applications for LOL, WTF, NBD, and FML for laundry detergents, liquid soap, cleaning products, and air fresheners. On July 26, the USPTO issued an Office action requesting more information about the significance of the LOL mark – specifically whether “LOL” refers to the words “laugh out loud.” P&G must respond to the Office action by late January 2019. On September 14, Hershey Creamery Co. filed a motion for summary judgment against its insurers, two Liberty Mutual companies, to defend and indemnify it in a 2014 action pending in Delaware federal court. Hershey claims that its general liability and umbrella policies cover the claims brought against it by competitor ice-cream maker F’Real Foods LLC asserting that Hershey ripped off several of F’Real’s advertising ideas, including its registered slogan “REAL MILKSHAKES ARE REAL BETTER.” The insurance policies exclude coverage for trademark infringement, except claims involving advertisements and slogans. The case is pending in the U.S. District Court for the Middle District of Pennsylvania. On September 14, The Cousteau Society filed a complaint against Celine Cousteau, the granddaughter of the late world-famous oceanic explorer Jacques Cousteau, for her unauthorized use of his name, image, and iconic red cap to promote her television program, “Celine Cousteau, The Adventure Continues,” in which she revisits places her grandfather explored during his lifetime. According to the complaint, the Society, run by Cousteau’s second wife, owns Cousteau’s worldwide IP portfolio including his registered and unregistered trademarks, rights of publicity, and copyright interests. The complaint alleges trademark infringement, false association, false designation of origin, and unfair competition, and seeks a declaratory judgment that Ms. Cousteau infringed on and violated the Society’s rights. It also seeks an injunction preventing Ms. Cousteau from using his name, image, and iconic red cap, and damages. The case is pending in the U.S. District Court for the Southern District of New York. On September 10, the Federal Circuit affirmed a TTAB decision that Detroit Athletic Co., a small sports gear retailer, could not register its name for trademark protection for sports team-related apparel because it would likely be confused with the mark DETROIT ATHLETIC CLUB registered for clothing goods. Since 1887, the Detroit Athletic Club has been operating in downtown Detroit as a private social and athletic club. Detroit Athletic Co. argued that the TTAB erred in balancing the relevant DuPont factors to determine that there would be a likelihood of confusion. According to Detroit Athletic Co., the Board “failed to consider the marks in their entireties and instead emphasized the similarity between the marks’ first two words while downplaying the differences between their terminal words.” The Federal Circuit disagreed finding that the Board did assess the marks in their entireties, and that while the words “Co.” and “Club” do differentiate the marks, the addition of those words would likely do little to prevent consumer confusion. On May 4, Yeti, LLC, the company owned by former Jacksonville Jaguar football player, Dan Skuta, filed an opposition to the team’s trademark application for the mark “#Sacksonville.” The opposition claims that Skuta created the Sacksonville name in 2015 in reference to the team’s strong defense that often tackled or “sacked” the opposing quarterback. The opposition further claims that Skuta developed exposure for the mark on social media and commercially exploited the mark in connection with selling Sacksonville branded merchandise from his website www.sacksonville.org. The Jacksonville Jaguars’ answer is due on October 12. Join us in Paris for some Fashion Law! The Federal Bar Association and the French American Bar Association are pleased to invite you to the Second Annual Fashion Law and Innovation Conference that will be held October 24, 2018 in Paris, France. Join us for the conference and a cocktail reception following the panels. You can find more information about speakers and registration here. À bientôt, j'espère! "bryant park restaurat" by Dan DeLuca is licensed under CC by 2.0 - no changes made. While a blog post about the restaurant industry is, admittedly, not related to fashion, it does have one thing in common: trademarks. I recently co-authored an article on Brands and Consumer Loyalty for the restaurant industry. It is basic overview of the top 10 pitfalls that I have seen restaurants encounter when handling their trademarks. These principles are equally applicable to the fashion industry, which is why I am sharing it here. Hope you enjoy and let me know your thoughts via direct message or in the comments below. Earlier this year, fashion brand Steven Madden, Ltd. filed a declaratory judgment action against Jasmin Larian, LLC in a trademark dispute involving the latter’s Cult Gaia “Ark” bag, a structured handbag made of interlocking rigid strips arranged in a half-moon shape. The dispute arose after Larian’s counsel had sent a cease and desist correspondence to Madden requesting that it cease and desist from the marketing and sale of Madden’s virtually identical “BShipper” bag. In its papers, Madden seeks a declaration that the “Ark” design is generic and not protectable because it “slavishly copies the traditional Japanese bamboo picnic bag design… from the 1940s.” Read more here, or direct message me for a PDF copy. Dunnington is the Gold Sponsor of the Federal Bar Association’s Annual Meeting, September 13-15, 2018, at the New York Marriott Downtown. The convention draws federal practitioners and judges from all over the country. The program features a reception at the Tribeca Rooftop hosted by the Southern District of New York Chapter of the FBA, presided by Dunnington partner Donna F. Frosco. We encourage you to join us in the festivities at the Tribeca Rooftop, and attend the top-notch CLE sessions scheduled throughout the day. Register for convention here. Dunnington partners Olivera Medenica and Donna Frosco will present on a trademark licensing panel along with Rita M. Odin, VP and Senior Trademark Counsel at Estee Lauder Companies, Inc., and Viviana Mura, Head of Global Trademark Practice at Luxottica Group. The panel will be moderated by incoming Federal Bar Association President Maria Z. Vathis, of Bryan Cave Leighton Paisner LLP. Register for convention here. With competition in the restaurant industry at an all-time high, a restaurant’s positive image in the minds of the consuming public is more important than ever. Restaurateurs can take basic steps to protect and maintain rights in the restaurant’s marks that will save the business time and money in the future. Registering the restaurant’s trademark with the USPTO and policing others’ use of the mark are just the first steps to protect the mark. Other issues such as whether or not to use a surname or a geographic location in the name of the restaurant, and issues relating to licensing the mark are among the other considerations restaurant owners should note when ensuring that the brand’s image is protected. See the complete top-ten list of trademark tips for restaurants here. After nearly 20 years of trademark litigation between the jean maker Lucky Brand and Marcel Fashions Group, a small apparel company operating under the name “Get Lucky”, the Second Circuit ruled that it was too late for Lucky Brand to assert its defense that Marcel’s claims were barred by a 2003 settlement agreement that released Lucky Brand from liability. On August 2, Judge John M. Walker wrote for the three-judge panel, “under certain conditions, parties may be barred by claim preclusion from litigating defenses that they could have asserted in an earlier action, and that the conditions in this case warrant application of that defense preclusion principle.” This is the first time the doctrine of res judicata has been used in this way. The Court vacated the district court’s judgement and remanded for further proceedings in which Lucky Brand could not assert the defense. In 2006, the EUIPO granted Nestlé a trademark for the three-dimensional, four-fingered shape of its Kit Kat candy bar. On July 25, 2018, the Court of Justice of the European Union ruled that the registration had been improperly granted because Nestlé had not shown that consumers “throughout the member states of the EU” – particularly, Belgium, Ireland, Greece and Portugal – recognized the candy bar as the company’s trademark. This dispute began in 2007 when the company that owns rival candy brand, Cadbury, challenged Nestlé’s EU registration. The Court sent the case back to the EUIPO to reconsider the registration. On July 30, the Ninth Circuit revived a trademark infringement lawsuit in which the owner of the mark for “Honey Badger Don’t Care” originating from his viral YouTube video, sued Drape Creative Inc. (owner of Papyrus-Recycled Greetings Inc.) and its subsidiaries for their use of variations of the Honey Badger mark on greeting cards. The lower court held that the trademark owner did not satisfy the Rogers v. Grimaldi standard that only allows infringement claims involving expressive works to proceed when “the public interest in avoiding consumer confusion outweighs the public interest in free expression.” The Court ruled that the issues in the case are not so clear-cut, and that the lower court erred in its decision that the case did not need to go to a jury. On July 30, the TTAB affirmed the USPTO’s refusal to register the mark “Copper 88” for "clothing made of fabric containing copper, namely, athletic sleeves, sweatshirts, pants, scarves, scrubs not for medical purposes, shorts, socks, T-shirts and underwear, shoes, gloves, hats." The applicant argued that "no reasonable consumer would expect that clothing would be 88% metal” and that the mark is "too remote from any specific technical feature of the product" to "provide meaning to the consumer.” The Board disagreed. By including the word “copper” in its filed description, the Board wrote that the applicant conceded the descriptiveness of the mark. The Board also noted that the applicant's website and third-party websites state that the goods contain 88 percent embedded copper. On August 2, the TTAB ruled that a brewing company could register its mark “Superpower” for beer, despite opposition from the company that owns POM Wonderful that consumers would confuse the mark with its registered “Antioxidant Superpower” mark for fruit juice. Although, in the past, the Board has said that consumers would consider wine and spirits to be closely related for trademark purposes, in this case, it said that POM failed to show that pomegranate juice shared that same connection. Son of the late actor Steve McQueen sued Ferrari on July 30 for injunctive relief and $2M in damages for marketing a special edition “McQueen” Ferrari without authorization or compensation. Plaintiff Chadwick McQueen stated in the complaint that in 2011, he met with Ferrari, toured the factory, and expressed an interest in collaborating on a “McQueen” edition, but the parties never entered into a deal. The complaint alleges that the unauthorized use of McQueen’s image and trademarks increase the value of the special edition vehicles because of the “Steve McQueen effect.” The case is pending in Los Angeles Superior Court. On May 24, 2018, the USPTO released Examination Guide 2-18, which states that trademark applications that are refused under 2(a) of the Lanham Act because they contain “scandalous or immoral” matter will be suspended until the final resolution of In re Brunetti, which was decided in December 2017. In Brunetti, the applicant attempted to register the word “FUCT” in connection with clothing. The U.S. Court of Appeals for the Federal Circuit ruled that refusing to register marks for this reason violates the First Amendment because it impermissibly restricts free speech. After being granted an extension to file a petition for a writ of certiorari, the USPTO has until August 10 to request that the U.S. Supreme Court weigh in on the matter. In April, The Museum of Modern Art filed a complaint alleging that MOMACHA, a new trendy matcha tea and gallery space, is willfully infringing on its registered trademark “MOMA” and diluting its famous brand. MoMA brought the action after MOMACHA refused to comply with MoMA’s cease and desist letter and abandon its trademark applications for MOMA and MOMACHA. MOMACHA claims that it created its name by combining “more” and “matcha.” MoMA says that the marks share the same visual elements – both using black and white block letters. MoMA filed a motion for injunctive relief against MOMACHA, and MOMACHA filed a motion to dismiss the dilution claim. Rulings on these motions are currently pending in the SDNY. On July 16, Promotion In Motion Inc., the company that makes Welch’s fruit snacks, sued Kervan USA LLC, a competitor candy maker that produces Sunkist’s fruit gummies. The complaint alleges that the packaging for the Sunkist gummies “imitate(s) the distinctive trade dress features” of the Welch’s packaging and that packaging designs “are carefully calculated to siphon off the good will” of the Welch’s brand. The case is currently pending in the U.S. District Court for the District of New Jersey. In June 2018, a judge in Florida ruled that Hard Rock Café Inc. was unlikely to win a trademark infringement lawsuit against RockStar, a line of luxury hotels, and refused to provide injunctive relief. In an order on Hard Rock’s motion to voluntarily dismiss without prejudice, Judge Beth Bloom stated that “this lawsuit has forced defendant to expend considerable resources” and that it would be “appropriate to condition plaintiffs’ voluntary dismissal without prejudice on its payment of defendant’s litigation-related expenses.” On July 19, Hard Rock subsequently filed a second motion to voluntarily dismiss, this time with prejudice, arguing that there should be no award of attorneys’ fees and costs because discovery had revealed new information about the nature of RockStar’s services. The case is pending in the U.S. District Court for the Southern District of Florida. 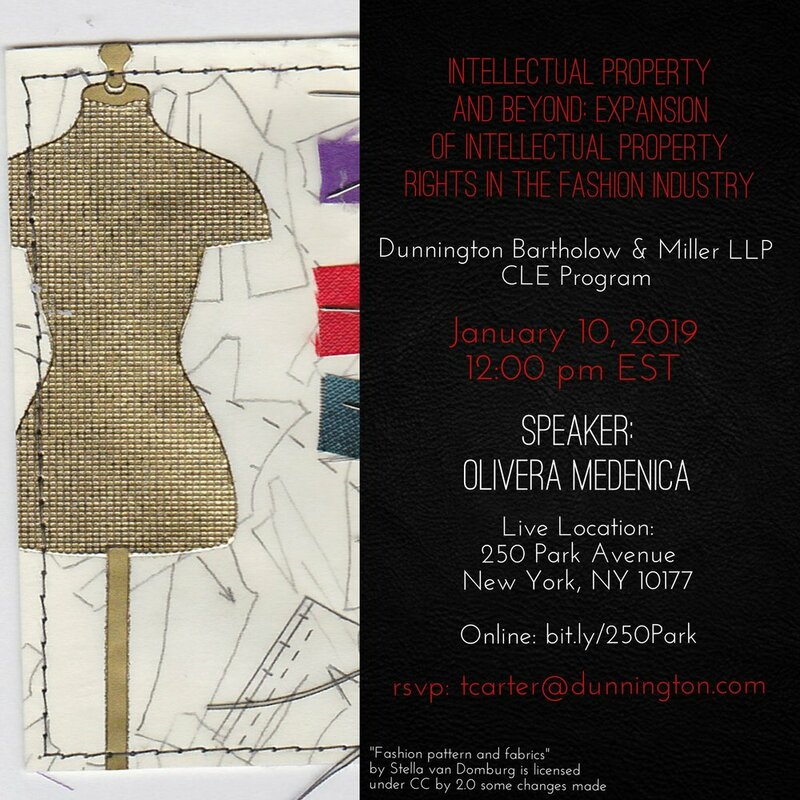 Dunnington partners Olivera Medenica and Donna Frosco will present on a trademark licensing panel along with Rita M. Odin, VP and Senior Trademark Counsel at Estee Lauder Companies, Inc., and Viviana Mura, Head of Global Trademark Practice at Luxottica Group. The panel will be moderated by incoming Federal Bar Association President Maria Z. Vathis, of Bryan Cave Leighton Paisner LLP. Register for the convention here. A common mistake that brand owners do is naming their business by their last name. For example, Smith Fashions for a clothing brand, or Smith Widgets for selling widgets. The problem arises when a brand owner has expanded significant advertising revenues to develop the brand, and decides to register it with the United States Patent and Trademark Office (USPTO). The application ultimately results in a denial, to the great surprise and deception of the applicant. The USPTO has a rule called “primarily merely a surname” which bars the registration of trademarks that consist of a last name. The issue is whether the word itself sounds like a last name. The test for determining whether a mark is “primarily merely a surname” depends on the primary significance of the mark as a whole to the purchasing public. If the primary significance of the word is understood to be a last name, then the bar applies, and the registration will be denied. Hence the name of the rule. There are several factors that the trademark examiner will evaluate in determining whether the word is “primarily merely a surname”: (1) whether the surname is rare; (2) whether the term is the surname of anyone connected with the applicant; (3) whether the term has any recognized meaning other than as a surname; (4) whether it has the structure and pronunciation of a surname (sounds a whole lot like a surname, but is not a common one); and (5) whether the stylization of lettering is distinctive enough to create a separate commercial impression. The fact that the last name is combined with another term could potentially take it out of the rule, but that needs to be determined on a case by case basis. For example, consider the examples above that contain a last name, but are combined with a descriptive term. This would be problematic as the USPTO would disregard the descriptive term and only examine the last name. But there are ways to avoid the rule. For example, by combining the last name with initials, or a first name, or using some significant design elements. You can also overcome the rule by showing that a brand is famous, and that it has acquired secondary meaning. In other words, that the public recognizes the brand as coming from a particular source. This can be challenging and the subject matter deserves another blog entry. Some examples of the rule and its application are included below. So the next time you are considering using a last name, whether it is yours, or that of someone else, perhaps give it a second thought. In re Isabella Fiore LLC, 75 USPQ2d 1564 (TTAB 2005) (holding FIORE not primarily merely a surname where it is also the Italian translation of the English word "flower" and the non-surname meaning is not obscure); In re United Distillers plc, 56 USPQ2d 1220 (TTAB 2000) (holding the relatively rare surname HACKLER not primarily merely a surname, in light of dictionary meaning); Fisher Radio Corp. v. Bird Elec. Corp., 162 USPQ 265 (TTAB 1969) (holding BIRD not primarily merely a surname despite surname significance); In re Hunt Elecs. Co., 155 USPQ 606 (TTAB 1967) (holding HUNT not primarily merely a surname despite surname significance); In re Pickett Hotel Co., 229 USPQ 760 (TTAB 1986) (holding PICKETT SUITE HOTEL primarily merely a surname despite applicant’s argument that PICKETT is the phonetic equivalent of the word "picket"); cf. In re Monotype Corp. PLC, 14 USPQ2d 1070, 1071 (TTAB 1989) (holding CALISTO not primarily merely a surname, the Board characterizing the telephone directory evidence of surname significance as "minimal" and in noting the mythological significance of the name "Callisto," stating that it is common knowledge that there are variations in the rendering of mythological names transliterated from the Greek alphabet (distinguishing Pickett Hotel Co., 229 USPQ 760)); In re Joint-Stock Co. "Baik," 84 USPQ2d 1921, 1924 (TTAB 2007) (finding the extreme rarity of BAIK weighed against surname refusal); In re Benthin Mgmt. GmbH, 37 USPQ2d 1332, 1333 (TTAB 1995) (finding the fact that BENTHIN was a rare surname to be a factor weighing against a finding that the term would be perceived as primarily merely a surname); In re Sava Research Corp., 32 USPQ2d 1380, 1381 (TTAB 1994) (finding SAVA not primarily merely a surname, where there was evidence that the term had other meaning, no evidence that the term was the surname of anyone connected with applicant, and the term’s use as a surname was very rare); In re Garan Inc., 3 USPQ2d 1537 (TTAB 1987) (holding GARAN not primarily merely a surname); In re Industrie Pirelli Societa per Azioni, 9 USPQ2d 1564, 1566 (TTAB 1988) (holding PIRELLI primarily merely a surname, the Board stated that "certain rare surnames look like surnames and certain rare surnames do not and . . . ‘PIRELLI’ falls into the former category . . . ."); In re Petrin Corp., 231 USPQ 902 (TTAB 1986) (holding PETRIN primarily merely a surname). Under New York's Code of Professional Responsibility, portions of this Web site contain attorney advertising. Prior results do not guarantee a similar outcome. Results depend upon a variety of factors unique to each representation.